The latest meeting of the Flamsteed Radio Astronomy group was held in the Endeavour Room at the ROG on Saturday 26th October 2013. Grey Lipley opened the meeting by welcoming those present and in particular some new faces amongst some more familiar ones. He then got the meeting underway by giving a short presentation on his most recent visit to the Norman Lockyer Observatory (NLO). He said that he was very impressed by work being carried out there, particularly that of the radio astronomy group and encouraged by the fact that the radio astronomy equipment and displays proved to be very popular with the public during the observatory’s open days. 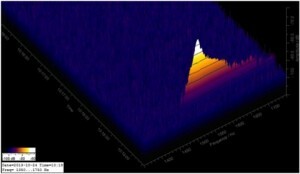 During his conversations with the members of the radio astronomy group, Grey described some of the exploratory work being carried out by the Flamsteed radio astronomy group members into solar flare detection using the society’s VLF Receiver and meteor detection using a RADAR Backscatter technique. Similar techniques have been up and running at NLO for sometime and Grey said that the radio group there would willing to give the Flamsteed group help and advice in setting up an automatic meteor detection system and were very interested in exchanging any data subsequently collected. During a following discussion it was agreed that it would be worthwhile arranging a visit to the NLO by interested Flamsteed members early in the coming year. This was an opportune moment for Clive Inglis to bring the group up to date on the meteor detection work he had described at the last meeting on 27th April 2013. 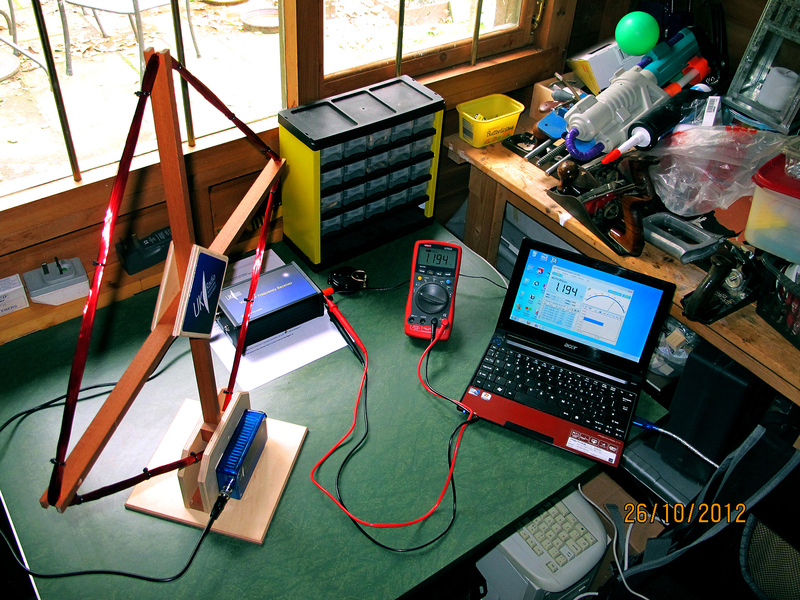 For the new members present he explained that this was based on detecting the RADAR signal from the Graves Radar in central France, backscattered from ionised meteor trails to Clive’s receiving system using a Funcube Pro + radio dongle. 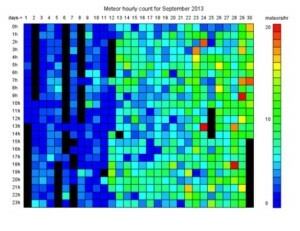 As he explained at the previous meeting, the hourly meteor count rates measured during the Lyrid meteor shower and presented as a histogram were obtained by manually counting meteor “chirps” recorded over a 24 hour period using the SpectraVue software. This method would be impractical for continuously detecting meteors. He described his revised recording system which now uses the Spectrum Lab software to capture and record the backscattered signals. Spectrum Lab is an audio spectrum analyser with a waterfall display and is used to carry out real-time audio processing on the FunCube receiver output. He presented a waterfall display (shown above), captured during a meteor detection, showing the “chirp” in signal frequency due to a the Doppler shift that occurs during reflection from the ionised meteor trail. Clive explained how Spectrum Lab can be programmed to discriminate the meteor chirp from other noise signals and to automatically count each meteor, then save the associated waterfall plot and sound file. 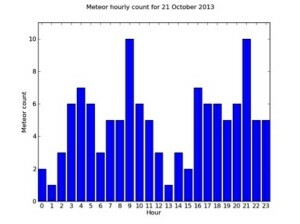 A histogram of the Hourly Meteor Count is then built up on an hour by hour basis using a Python script. This histogram and each waterfall plot can then be published to a web server using a simple batch script. He then showed a colorgram plot for September automatically built up from meteor counts for successive days by a second Python script. The meteor count for a given hour is indicated by a cell colour in the range of blue(0) to red (maximum count), a black cell indicates no data collected. The increase in meteor activity around dawn and dusk can be observed. Clive explained that the apparent increase in meteor count through the month was partly due to adjustments he made to find the optimum detection threshold, this work is continuing. In the short discussion which followed it was agreed that this type of radio observation and radio astronomy in general offers the potential to display to the general public astronomical events as they are happening, 24 hours a day, 7 days a week. The interest shown by visitors to the Norman Lockyer Observatory confirms this. We should, therefore approach the ROG to investigate the possibility of displaying the data collected by our Flamsteed group to visitors to the observatory.